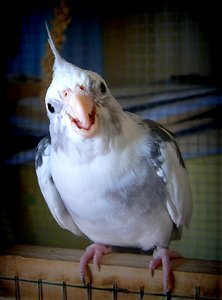 My second cockatiel trying to be aggressive. Unfortunately, he's cute as a button! Sadly, he died 17/03/2015. RIP Little Chicken. Very funny! So cute... and omg, look at those little pink feet!